Long-time Boca youth veteran Chris Konopka has been named to roster of the US Soccer U-19 Men’s Region I Olympic Development Team that will travel to France to compete in the 2004 IC Croix International Tournament. It will be the third time this year the GK is selected for competition. TOMS RIVER, NJ (May 19, 2004) – Chris Konopka, a long-time youth member of the Jersey Shore Boca soccer club, has been named to roster of the US Soccer U-19 Men’s Region I Olympic Development Team that will travel to France to compete in the 2004 IC Croix International Tournament as announced by the team’s coaches Gene Klein and Gerry Sharpe. This is the third time this year that the goalkeeper has been named to the roster of the US Soccer U-19 Region I team and second time that he has been called for international duty. In January, Konopka participated in a week-long inter-regional competition with the US Region I team at the Home Depot Center in Carson, California and earned a 1-1 tie in a full ninety minute match against the United States U-20 Men’s National Team whose roster included Major League Soccer players Freddy Adu (DC United), Arturo Alvarez (San Jose Earthquakes) and Guillermo Gonzalez (LA Galaxy). In April, Konopka helped the US U-19 Region I team advance to the semi-finals of the Tournoi International de Reze, one of the world’s most competitive international soccer tournaments held in Reze, France. He allowed only four goals during the ten day trip to Reze, earned three shut-outs and compiled an overall international record of 3 wins, 2 losses and 2 ties. 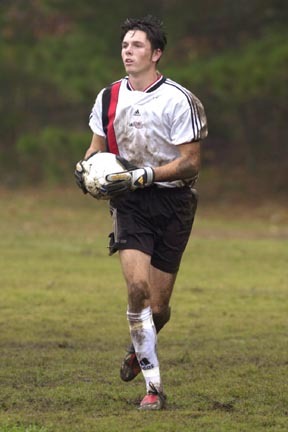 Konopka is one of sixteen top college freshmen and high school senior standouts from Maine to Virginia who were named to the roster of the US Soccer U-19 Region I team for the 2004 IC Croix International Tournament. The US Soccer Region I team will depart from New York on May 22nd and arrive overseas the following day. The team will spend their first four days in Brussels while participating in daily training and fitness sessions and will also compete in two international friendly games against reserve teams from top Belgium professional clubs during their stay. On Thursday May 27th, the US Region I team will travel to Croix located on the Northern coast of France in preparation for the tournament which continues through May 31st. The 2004 IC Croix International Tournament field contains developmental teams from some of the top professional soccer clubs in the world including Sao Paulo (Brazil), Boavista Porto (Portugal), Osasuna (Spain), Aalborg (Denmark), Den Haag (Holland), Lille OSC (France) and host IC Croix (France) among others. Coach Gerry Sharpe holds an US Soccer Federation A license, English Full Badge and is a former professional player with Bristol City, England. Coach Gene Klein, a specialist in goalkeeper training, holds an Advanced National Coaching Diploma awarded by the National Soccer Coaches Association of America as well as an A coaching license of the United States Soccer Federation. Konopka just finished his freshman year at NCAA Division I Providence College where he helped the Friars advance over nationally ranked Virginia Tech to the semi-finals of the Big East Men’s Soccer Tournament for the first time since 1987. He posted a 1.63 goals against average and 72.2% save percentage as a college freshman. Konopka also recently signed with the Jersey Falcons of the United Soccer Leagues Premiere Development League, the top amateur soccer league in the United States. As of Sunday May 16th, Konopka started and played in 2 of 3 games for the Falcons; a 3-1 loss to the two-time defending PDL National Champion Cape Cod Crusaders and a 2-1 loss against the current PDL Northeast Division leading Reading Rage. Konopka made 32 saves during 180 minutes of action which ranks him 2nd among all PDL goalkeepers nationwide in total saves and 1st in average saves per game with 16. The standout goalkeeper is also being considered for the United States Under-20 Men’s National Team player pool. He was named one of the top 3 high school goalkeepers in New Jersey as a senior receiving All-American accolades among other honors. In addition to being a veteran of several Boca youth club teams, Konopka was a member of Boca’s 2003 Premiere Development League team and Super Y-League teams in 2002 and 2001. He is an aspiring computer graphics and design major at Providence.